I first came across this tool this year when I saw a demonstrator (Craig Jackson - the inventor of the Ci1 Easy Rougher) creating copious amounts of ribbons on a booth at the AAW. I was surprised as it was being used to rough down some bowl blanks and cylinders. The Ci1 Easy Rougher is a square-shanked tool with a replaceable tip and I didn't experience as much of the usual physical judder encountered when using gouges for this purpose. The tool I used came with a 430mm (17in) handle and had the chip deflector (optional extra). 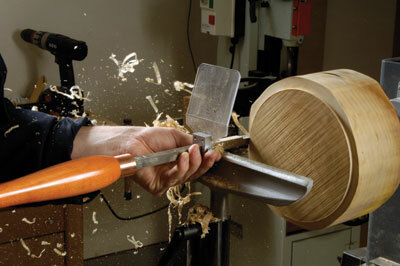 I had to get my head around not using a gouge for the initial roughing of a bowl and a cylinder also. The blade is presented flat onto the rest and is then pushed into the work or traversed from side to side. The tip is a square cutter so three cutting faces that are able to be used. The tool is really easy to use - the lexan chip deflector was, I thought, a bit of a gimmick, but it isn't and prevented loads of shavings flying towards my face. It took a bit of getting used to push and arc the tool, purely because I am inculcated into using gouges the promotional spiel says up to 25mm (1in) cuts can be made. I tried it with a side cut 12mm (1/2in) deep over 305mm (12in) long. I expected some bite from the tool but it just didn't happen. It was the same result on cylinders. There seemed to be less motive force required to move the tool along the work. A few friends who tried it said it took the strain out of roughing down. We all turn slightly differently but they liked it and tried it on both dry and wet timber plus bowl and spindle grain work. Each time the result was the same. I am a person who has a very open mind as far as techniques and tools are used but was still surprised. It is more versatile than purely being used for rouging out or down in as much as it makes a scraper too for boxes and hollow forms too - especially when fitted with the crowned cutter. The minimal vibration encountered when roughing down certainly takes the strain away. It does not claim to replace the gouge for other work, and I do believe it wise that one should learn to use one for shaping more effectively. I, as a professional turner, advocate using a gouge for this type of work and along comes a tool that offers and alternative that I thought would not work efficiently but it does. It is simple to use and I cannot help but recommend this tool. I think many turners will benefit from experimenting with it. "I think many turners will benefit from experimenting with it"